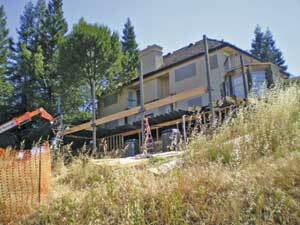 For many homeowners, tackling a residential remodeling project is a smart investment in their home’s future. Whether a whole home renovation, a kitchen or bath update, or creation of a new living space, the remodeling process, although somewhat daunting, can result in an exciting new home – without a change of address. “When I was eight, my younger brother and I started painting houses, and eventually we learned how to do trim, hang doors, and do carpentry,” he says. Seven years ago, Harry Headrick founded Rancho Cordova-based Expert Design & Construction, where brother Jeff serves as the firm’s general manager. Branching away from commercial projects, Headrick has followed his passion for residential remodeling. 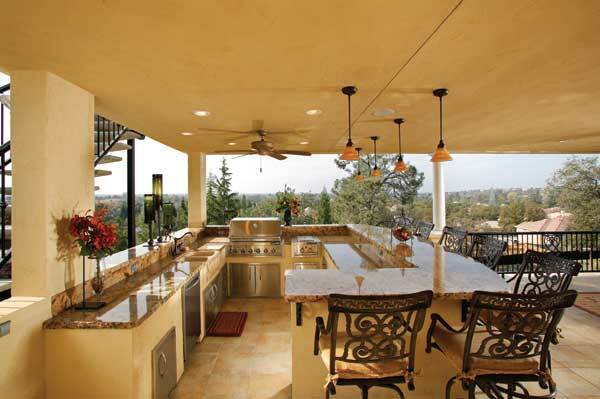 Today the award-winning, full-service design and build firm handles residential remodels, whole house renovations and outdoor living spaces additions throughout the greater Sacramento region. One recent Folsom project earned Expert Design & Construction a coveted “Contractor of the Year” award from the National Association of the Remodeling Industry (NARI). For homeowners Kevin and Casey Cane, Expert Design’s creation of a stunning outdoor living space in 2008 was the culmination of a dream. “The entire design and concept was something my husband had been envisioning for years,” says Casey. Originally built in the late 1990s, the Cane’s American River Canyon hillside home overlooks the bike trail, offering breathtaking views of downtown Sacramento and the Buttes. In designing a space worthy of such incredible vistas, Headrick’s team collaborated closely with the Canes over a period of four to five months. Following design, construction took another five months. The result? A dramatic 2,600-square-foot, two-story addition that includes a full outdoor kitchen, along with a distinct dining area and a living room showcasing a large fireplace with bench seating. A rich, warm color scheme, recessed lighting and plenty of cozy seating provide a welcoming setting for year-round indoor and outdoor living. Gorgeous custom teak cabinetry and features such as chiseled edge granite and a hammered copper prep sink add to the jaw-dropping visual appeal of the space. The ornate kitchen sink is hand-carved from a single slab of travertine. Remarkably, it’s something Kevin Cane found online. While these days he focuses on residences, Headrick called on his industrial experience for the unique challenges associated with this project. Because the Cane’s property boasted a six percent grade off, additional reinforcement was required. “We used red iron steel, just like what is used for skyscrapers, for the bones of the project, incorporating it in with regular wood framing,” Headrick says. 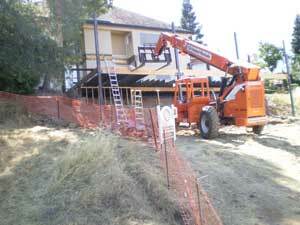 As a result they were able to shore up the existing foundation and make the house more stable through the renovation. As any homeowner who has undertaken a remodeling project knows, it’s difficult for life to remain normal during construction. Patience is definitely key. But for the Canes, who stayed in their home during the entire project, there was a unique set of challenges – twin newborns to be exact.